Welcome to a great week! How was your weekend? We watched C play her first outdoor soccer game and shivered as the hail came down on us, but then Sunday gave us warm, sunny skies (nearly 70 degrees), and we had some time for softball, some making, and even a run! Fitness, I will find you yet. 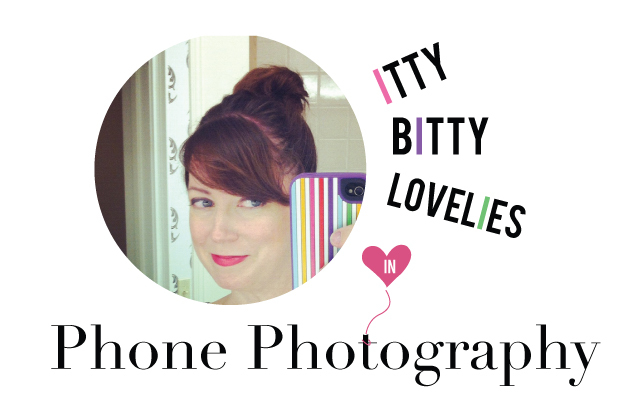 It's Monday, and Itty Bitty Lovelies is all about photography today - specifically, great photos from your phone. First off, are we buds over on Instagram yet? I'm @parscaeli, and I am on the hunt for some beautiful captures of the ordinary. Post your photos of the beautiful and mundane around you with the hashtag #celebratethenormal. The first round of shared photos will be posted on Wednesday (with a fun new prompt, too). I'm always hoping to craft better photos and find something really interesting to share. Here are some reads to help you follow me on my quest to become iPhone photo amazing. Kimberly at A Night Owl Blog has some reminders and great new info on photos from the phone. Things I discovered: how the HDR setting can make evening shots sing. I always wondered what that meant. I admit it, I find the myriad of filter choices for phone photography ridiculously fun. Veronica has seven photo editing apps to show off. What I love is the ways she shows the same photograph going through all the editing selections. I've seen more and more of VSCO CAM and PictTapGo. Which one did you fancy? I loved this idea of bringing Instagram right to your desktop.. and you don't even have to be actively using the technology. Would you want to see your friend's photos refresh as you go throughout the day? Check out this find from Cool Mom Tech. We have a busy week ahead with family heading our way for my oldest's First Communion. Crossing fingers for pleasant weather!! What's on your plate this week? Let's make it a good one!